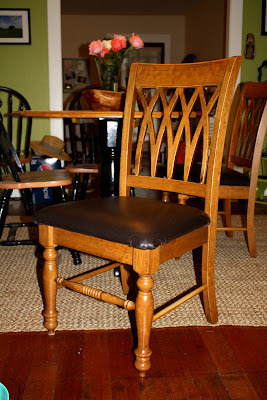 This week I tackled my dining room chair project. You might remember the chairs I bought at a consignment shop that I wrote about here. I decided to try the light blue "Enamelware" Martha Stewart paint I had used on my magazine rack on the chairs. 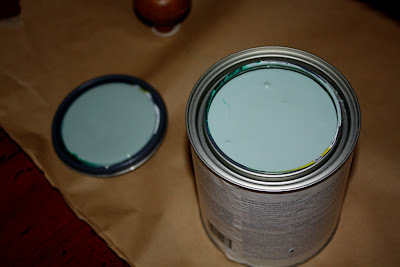 The color is a very, very light blue that I thought would work well with our bright green dining room, and also bring more blue into the room to go along with the shelf paper stripes in our corner cabinet. Here's a reminder of what the chairs looked like before. 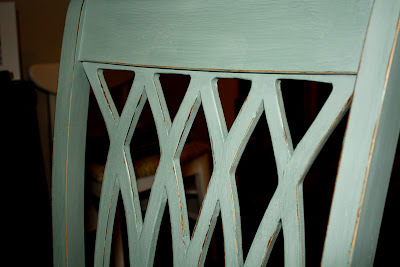 I really love the lattice backs! 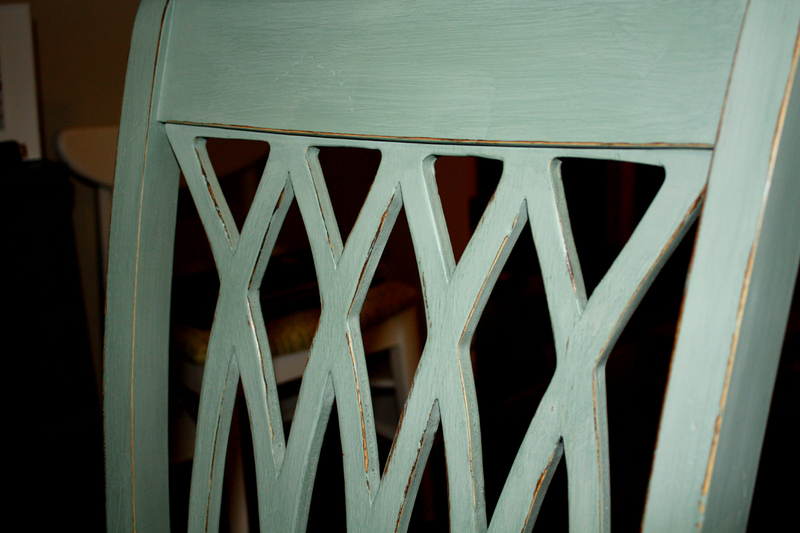 And then the cross bar, I love how the center detailing looks! I next set to work re-covering the seat. 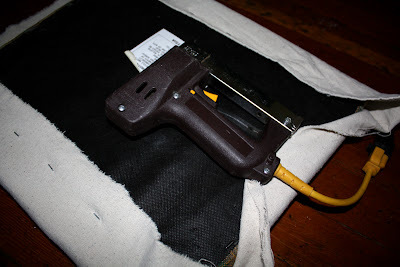 I first removed the fabric by prying up the staples on the underside of the seat with a screwdriver. 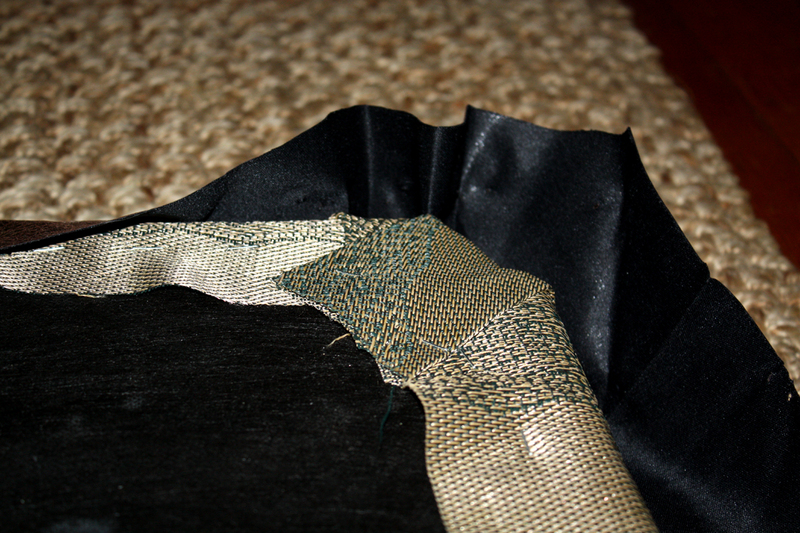 When I finished with that, guess what I found, another layer of fabric. So back I went removing more staples. And when all those were removed I found the original fabric .......... okay, I was done removing staples, that layer would stay! 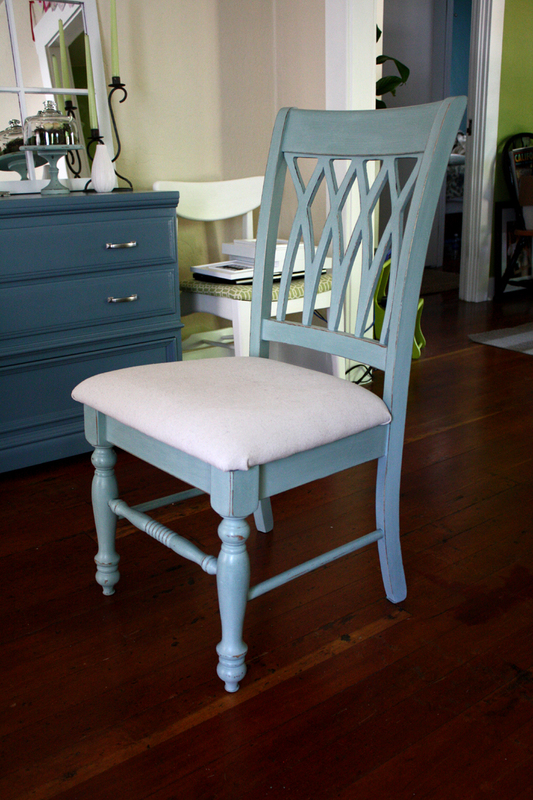 I decided to recover the seat in some drop cloth canvas fabric I bought a while back at Home Depot. 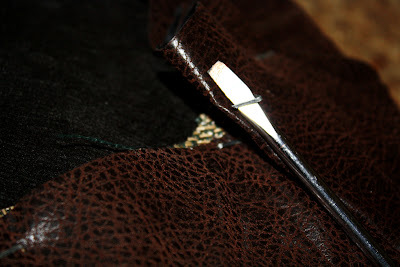 I really liked the texture, it was cheap, and I have a lot left over, so if I have to recover them again later because of a spill or something I would have more fabric at the ready. 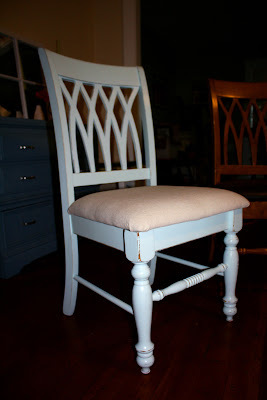 I cut the fabric to size, pulled it tight around the seat, and stapled it into place on the underside of the chair seat. For the corners I just worked with it, folding the edges kind of like a present until the fabric was pretty smooth and stapled it into place. 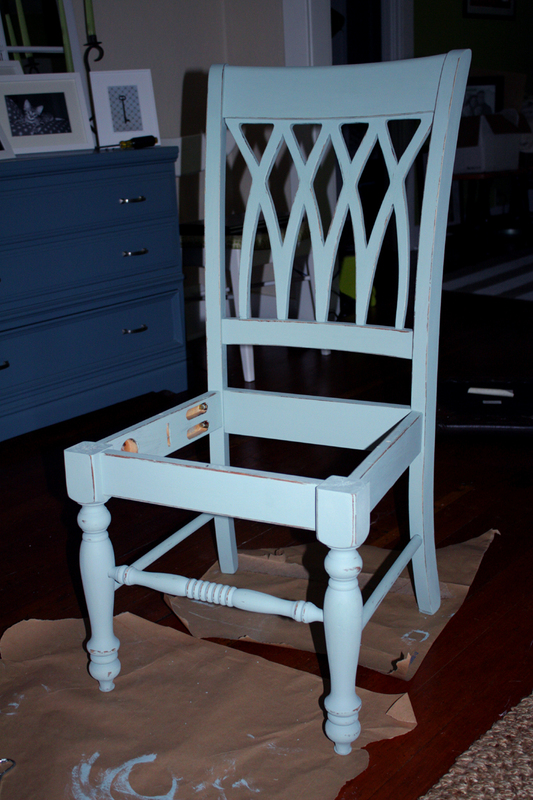 I reattached the seat to the chair frame and voila, I had a blue chair. BUT! ....... the story doesn't end there. 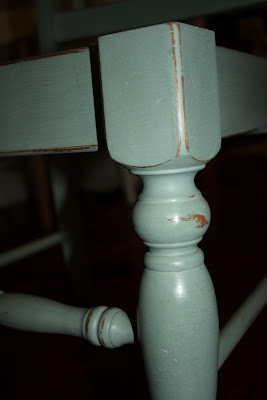 The light blue with the canvas combination was too light for me and especially with our bright green dining room, things just weren't working together. I was bummed. All that work and I didn't have a finished project I loved. I thought about trying a brighter and patterned fabric on the seat but my trip to JoAnn's did not yield any results. ........ So, I thought this would be a perfect time to try one of Annie Sloan's paints that everyone in blogville has been raving about. My failure was working out perfectly, now I had an excuse! 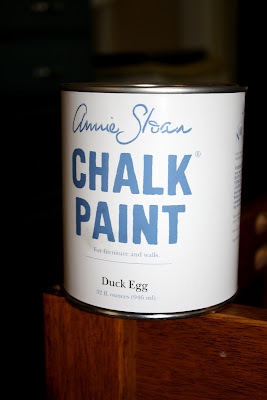 This past Saturday I ordered some paint in Duck Egg Blue from the House of Anne and it arrived on Wednesday. I was so excited to see that package, I tore into it like it was Christmas! It's another light blue but a bit darker than the previous I tried, with hints of green and grey. And guess what?! 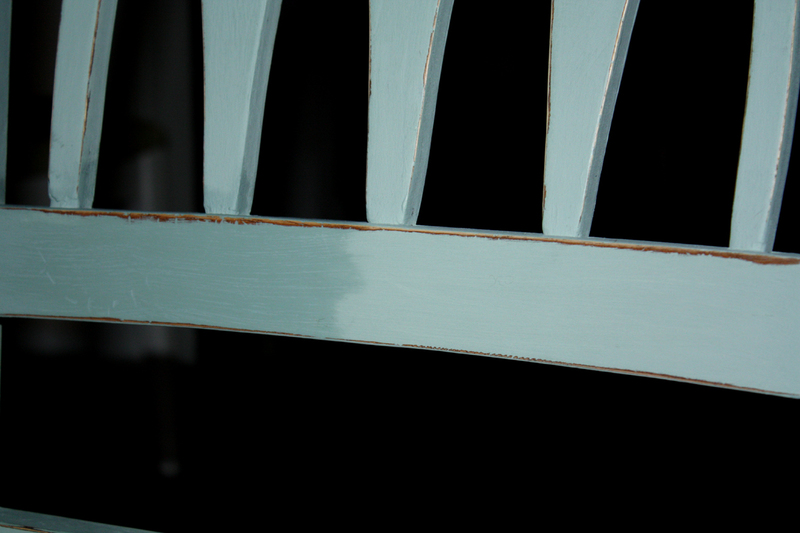 With this paint there is no need for sanding or priming, so I just jumped right in to the painting. This paint is fantastic! It goes on so smooth and the coverage is really nice. I did do two coats but that was mainly because I went really thin to prevent any drips in the paint. 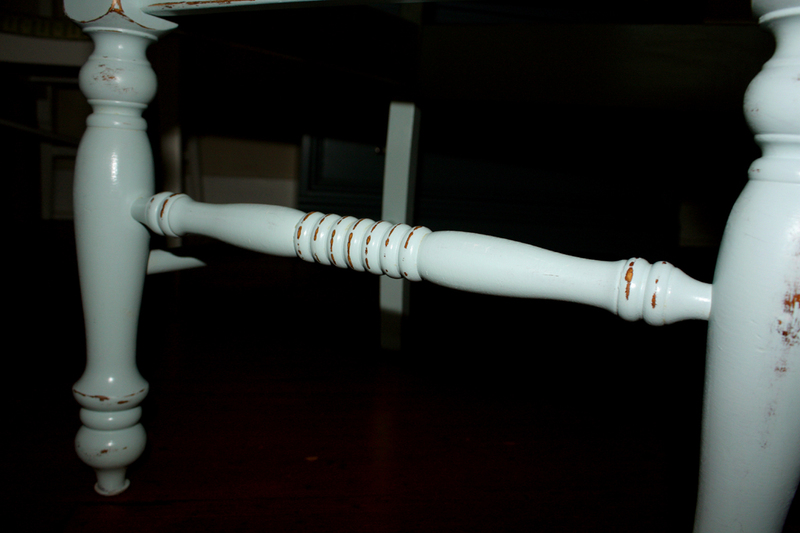 Then I got to the distressing. 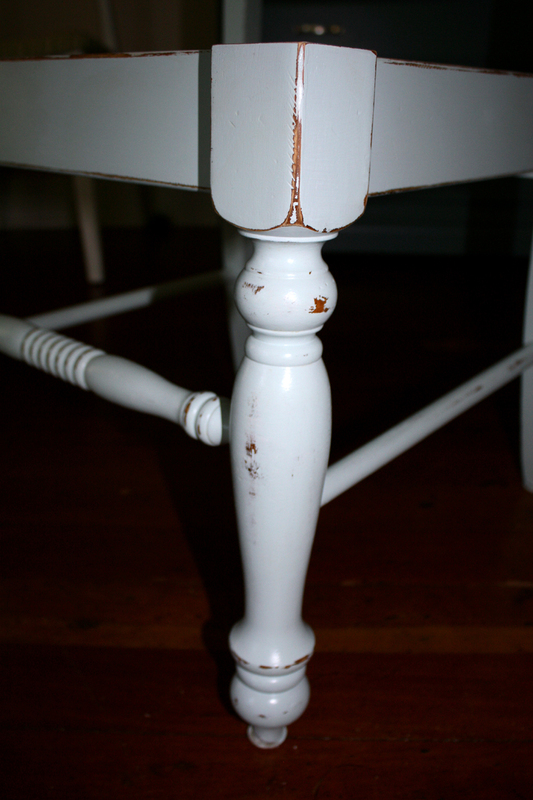 Unlike latex paint that rubs/peels off with sanding, the chalk paint actually comes off as a dust similar to sanding wood. This paint was made for distressing! For the sanding stage I decided to move outside as it can get pretty dusty. And don't forget that back! 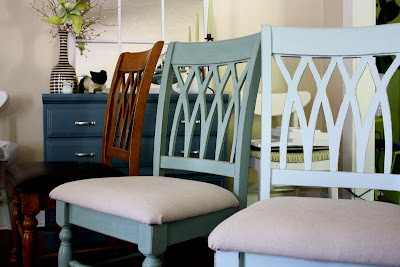 You can kind of see the green of the dining room with the chairs and I think the new blue looks a lot better ..... it could just be me. See, it is quite different, right? So now I know how I will spend my weekend. But at least with the Annie Sloan chalk paint I can get right down to business and get painting! Love it! You did great! 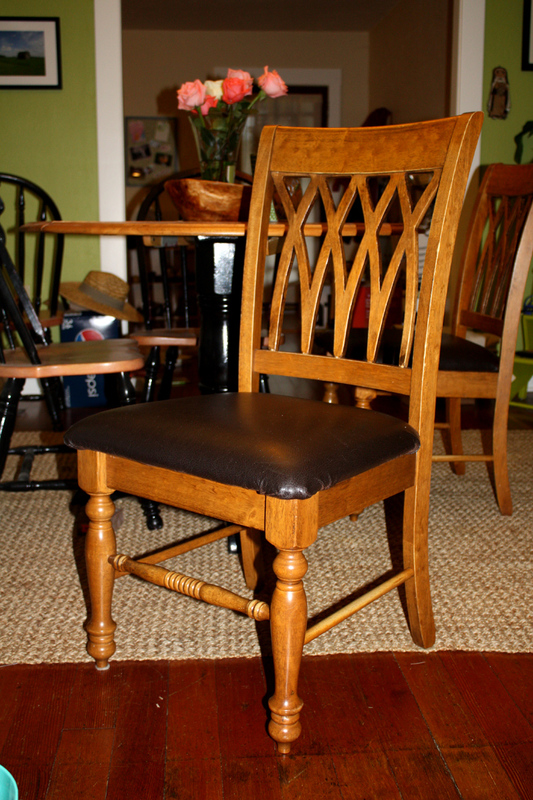 Looks great, I like the darker chair better. What a lot of work, but will definately be worth it!! Thanks! 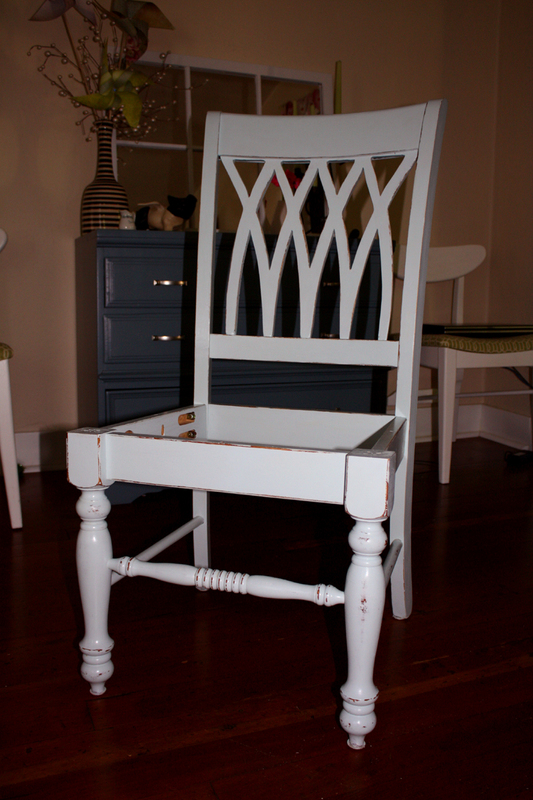 I just finished painting another chair, now waiting for it to dry before I can sand. I also found some flowery fabric I might try for the seat. We will see what happens! So how did the paint cover going straight on to the finished wood of the other chairs? Did you have to prep those in anyway?? 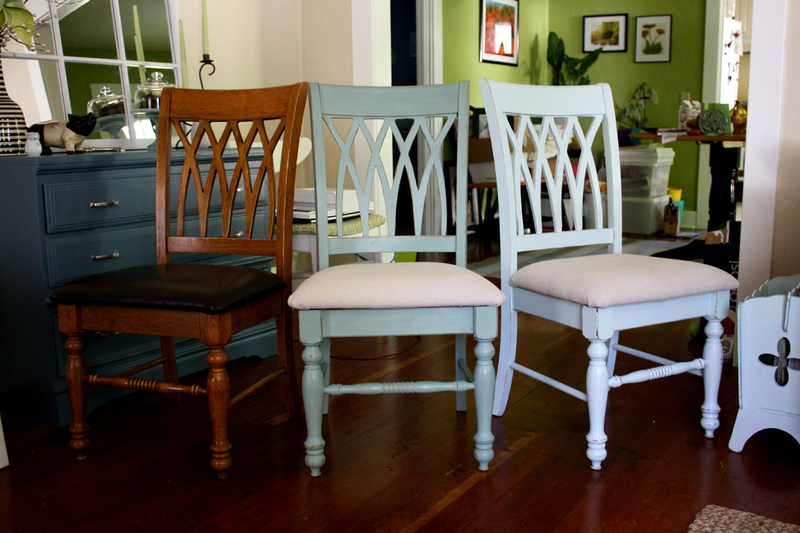 What was your final upholstery fabric choice? Would love to see! I like the darker blue like you said here....more of a contrast. Thinking about doing this same thing with some thrift store or craigslist chairs. Great inspiration! The bookcases are FINALLY finished!